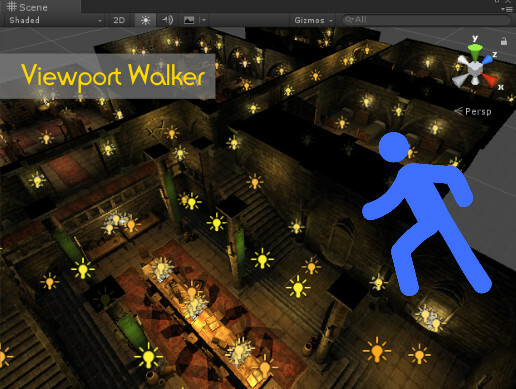 Viewport Walker allows you to use walker mode to navigate the scene view. Walker mode and Flythrough mode are similar, but different. Flythrough mode let you fly around in first-person view, but Walker mode let you walk around. A virtual gravity pull you to the floor, and you walk on floor even you looking up. Viewport Walker also provide a virtual sky level and let you jump to it, overlooking the scene. You can also enable or disable walk through walls in Walker mode. Only Renderer allows you to disable all gizmo overlay in scene view with one action (Click on toolbar item or use hotkey), instead of click on gizmo menu to disable one by one. It also restore the gizmo setting when you toggle off. Give you very fast to preview your level without gizmo overlay, then turn gizmo overlay on again to design your level. You can also save current gizmo and icon settings to presets, and use it with hotkey.